Forget Ikea – go for quality flat-packs! This little table is selling for £’000s!. 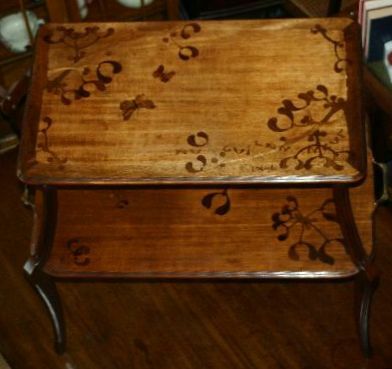 A recent Ebay auction caught my attention – a Louis Majorelle Gui pattern table for about £3500, and from a dealer just up the road in Gloucester!. What’s a Louis Majorelle Gui pattern? 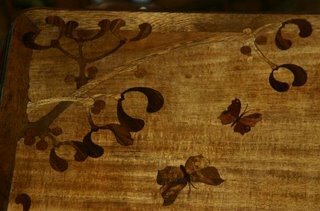 Well, as all mistletoe enthusiasts surely already know Majorelle (1859-1926) was one of the masters of art nouveau wood inlay furniture, operating out of Nancy, France from the 1880s. And Gui (Mistletoe, in French) was one of his regular themes. Not being in a position to invest this much cash I was slightly embarrassed to make enquiries but Trevor, the dealer, was happy to send more information. The table wasn’t sold online, and could still be seen in his shop within Upstairs Downstairs, an antique warehouse in the Docks at Gloucester. This was even better than I had hoped – as I know the Docks well (used to work there until 2 months ago) So I toddled along to have a look – and here are my pics. 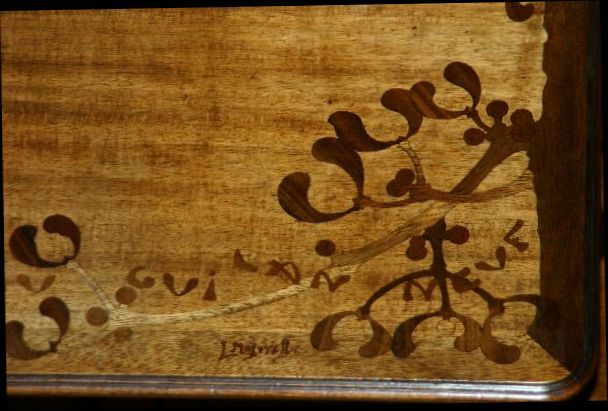 The étagère didn’t disappoint in the flesh – the inlay comprised mistletoe, plus butterflies, the French New Year mistletoe slogan Au Gui L’An Neuf (To the Mistletoe the New Year) and Majorelle’s signature. The pattern, like all Majorelle I’ve seen, was very Art Nouveau in style. (One peculiarity of this particular period of inlay is that I think it can look almost naïve to the uninitiated – but other opinions are most welcome – see the pics). I had been particularly intrigued by the online promise that the table could be delivered flat-packed. How, I wondered? But, to my surprise the top and base were secured via finger screws to discreet brackets on the legs – the piece was obviously designed for easy transport. 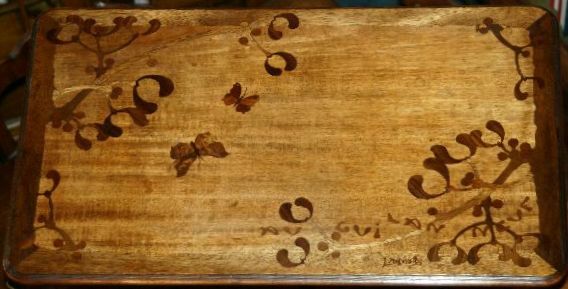 A quick internet search on Majorelle shows that the asking price is reasonable (and be reassured that LM products are always considered genuine) – so, if you’re interested get on down to Upstairs Downstairs, 2 Severn Road, Gloucester, Gloucestershire, GL1 2LE, Tel: (+44) 1452 421170. 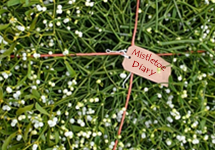 New info on this year’s Tenbury Wells Mistletoe Festival is now online – take a look at the new website at www.tenbury-mistletoe-festival.co.uk.